A historical perspective of an organization, as those cited by Willem Mastenbroek from over a decade ago are not only interesting as an evolutionary history of organization and the firm, but also facilitate insight into early management and human behavior. The examples also give a glimpse into what has necessitated change throughout history, motivated change and what facilitated change. In other words, what does history tell us about how organizations were able to adapt, and overcome in terms of their need for change and innovation? Using a military example, Mastenbroek describes how problems among troops were addressed using “a combination of procedural enhancement, and moral enhancing modifications” (n.d.). Mastenbroek describes an enlargement of these improvements with “delegation and autonomy enhancing instructions where this thinking translated into team spirit and even decreased casualties” (n.d.). One wonders if World War II was won in part (in spite of the high U.S. casualties), because we literally threw so many more humans at the conflict than the other side – not the best strategy to be sure. Mastenbroek makes the point that development within trade commerce was not unlike that of the developmental changes he described in the military history sections. Namely, “the skills of self-organization, [and as it turns out], ideas of autonomy and self-organization are not new” (Mastenbroek, n.d.). Innovation and Change – Is Aging an Asset or Liability? In another older article, Sorensen and Stuart suggest “aging on organizational competencies depends on the relative magnitude of the gains from experience with a set of routines and the losses due to various forms of organizational sclerosis” (2000, p. 3). They form four hypotheses related to the effects on aging both of an organization itself, and the employee population that makes up that organization. “Many scholars have argued that large size is associated with high levels of complexity and bureaucracy (Blau and Schoenherr, 1971) and a decline in organizational responsiveness that leads to reduced levels of innovation” (Sorensen and Stuart, 2000, p. 4) – does this not speak to our present time? Some truths simply transcend their contemporary context. …to preserve their privileged positions, dominant political coalitions inside the firm often have strong incentives to insure that the firm continues to focus on activities and market niches that require their expertise…as organizations age, they gain history and routines that limit their flexibility by restricting the range of organizational action (Sorensen and Stuart, 2000, p. 5). On the one hand, experience with a set of organizational routines leads to gains in the efficiency with which these routines are executed. On the other hand, in rapidly changing environments, the fit between organizational capabilities and environmental demands declines with age (2000, p. 19). The redemption perhaps, is that the lack of employee (and thus expertise) turnover with age can produce “gains in competence” (Sorensen and Stuart, 2000, p. 21), “but high levels of turnover also expose the firm to a greater variety of external influences…which may make it easier for the firm to stay abreast of new technological developments” (Sorensen and Stuart, 2000, p. 21). But this also creates a crisis in next generation executive leadership based on the age of our labor population, which we are also experiencing in our present time. How ironic that there is such a pent up desire for employment, yet difficulty in filling positions waiting for the right succession plan. Whether entrepreneurs are what they are by nature or practiced behavior, they are the risk takers, and consequently, often innovators. According to McCarthy & Leavy, the “charismatic type of entrepreneur is strategy driven, visionary and idealistic…underpinned by humanistic as well as commercial values” (1999, p. 129). This model takes on the typical caricature, which is often true of both this type of personality as well as this type of businessperson. Of the pragmatic type, McCarthy & Leavy state that this type is “calculated, down-to-earth, planned and rational (1999, p. 130). Oddly enough, either type could fail, succeed wildly, or continue somewhere in the middle. And just as aversion to risk is different among individuals, so too among those who enterprise for themselves “have varying degrees of risk tolerance” (McCarthy & Leavy, 1999, p. 131). Partnerships can be very helpful in entrepreneurship, as the Achilles Heel of self-employment, is the ability to make decisions in a vacuum, with no collaboration, alternative opinions, or critical assessment of ideas. In either type, you have the leaders, whose vision makes ideas and innovation possible, and who characteristics are often what are needed in large organizational leadership. 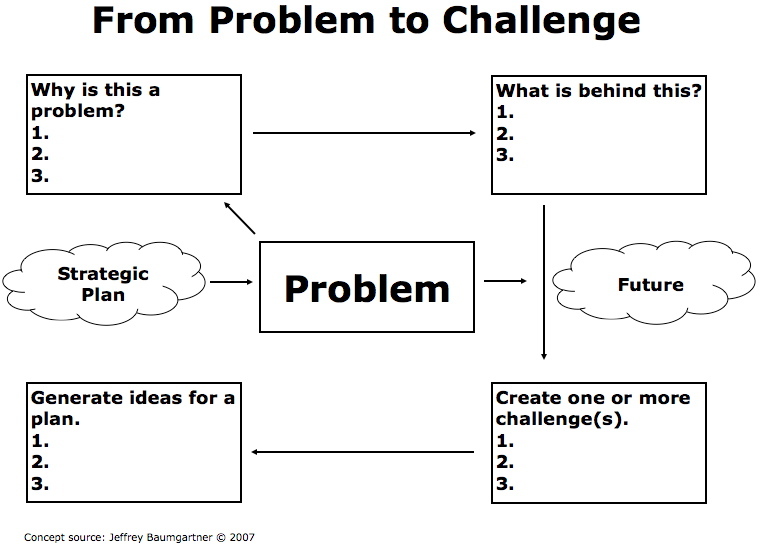 In this adaptation of Baumgartner’s ideas, an organizational (or any) problem can be analyzed through the process of brainstorming and creative thinking, with the challenges and action plan flowing from this exercise. Applying this concept to various organizations large and small, as Baumgartner points out, “we often come up with bad (or the wrong) solutions because they have not thought through the problem” (2007). As history shows us, though variables change due to technology and advancement of the day, innovation has and always will begin with thinking differently. (1997). Apple ‘Thinks Different’ in new ads. Advertising Age, 68(39), 2-62. Retrieved from Academic Search Elite database. Breda McCarthy, & Brian Leavy. (1998). The entrepreneur, risk-perception and change over time: A typology approach. IBAR, 19/20(1), 126-140. Retrieved March 1, 2010, from ABI/INFORM Global. (Document ID: 46433529). Morgan P. Miles, Linda S. Munilla, & Jeffrey G. Covin. (2004). Innovation, Ethics, and Entrepreneurship. Journal of Business Ethics, 54(1), 97-101. Retrieved March 1, 2010, from ABI/INFORM Global. (Document ID: 707276931).